Where do I use my Oldrids & Downtown voucher code? Oldrids & Downtown stock a huge range of living room, dining room and bedroom furniture as well as home office furniture, sofas and chairs and beds and mattresses from big brands like Julian Bowen, La-Z-Boy, Silentnight, Simba, Sweet Dreams, Gallery, Wood Bros and many more. As well as all this, you can also discover bedding, bathroom products, rugs, lighting, curtains and blinds, cushions, throws, draught excluders, kitchenware, tableware, home decor and utility products. Plus, small appliances, floor care, audio, telephones, personal care and more. If you’re looking for garden products you can find a vast array of garden furniture, barbeques, machinery, buildings and sheds, equipment, pools and spas, lawn and plant care and other garden accessories. Oldrids & Downtown even sell toys, beauty products, gifts, accessories, back to school products, pet products and more and supply a plethora of offers and sale items. Oldrids & Downtown stock a wide variety of toys including action figures, arts and crafts, play dolls, soft toys, electronic toys, LEGO, construction, games, puzzles, preschool toys, baby toys, outdoor toys and more. All these toys come from huge brands like Airfix, Barbie, BERG, Bigjigs, Gibsons, Hasbro, Jellycat, Lego, Little Tikes, Melissa & Doug, Nerf, Play-doh, Playmobil, Polly Pocket, Vtech and more. They also have a great selection of back to school accessories that include children’s footwear, lunchtime products, school bags, stationery and school uniforms. If you’re looking for luxury bedding products check out the beds and mattresses section at Oldrids & Downtown. Shop around and discover divans, bed frames, headboards and children’s beds as well as spring, memory foam and Tempur mattresses. All these products come from huge brands in bed industry including Ercol, Highgrove, Hypnos, Julian Bowen, Kaydian, Kaymed, Myers, Rest Assured, Salus, Sealy, Silentnight, Simba, Sweet Dreams and Tempur. Whether you’re looking for a comfortable new mattress or a luxurious upholstered bed in either a traditional or modern design, you can find them both at Oldrids & Downtown. And, you can buy with the complete confidence that each piece of furniture is handcrafted by skilled artisans using time honoured techniques to enhance the natural characteristics of the materials used. How can I contact Oldrids & Downtown? To contact Oldrids & Downtown please use the contact form. Please note that if you change your mind when you receive the goods and wish to return them, Oldrids & Downtown are happy to take them back within 28 days of you receiving the goods, as long as goods are in a fully saleable condition, with all packaging. 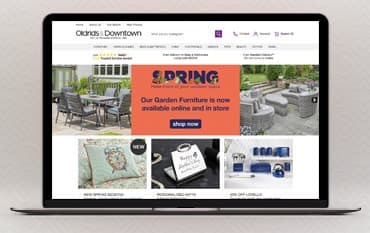 Oldrids & Downtown are an independent retailer of furniture, women’s, men’s and children’s fashion, cookware, electrical appliances, home accessories, toys and even garden furniture and machinery. With over 200 years of experience, Oldrids & Downtown have a vast range of knowledge to help you find the perfect product for you, your home and your garden and they also supply a great range of offers and deals to help you save money on your purchases. You can also use an Oldrids & Downtown discount code from us here at NetVoucherCodes to cut costs even further on your order.